Dwindling In Unbelief: Eugene's Bible: Did the Bible inspire the naked face-chewing cannibal? Eugene's Bible: Did the Bible inspire the naked face-chewing cannibal? Rudy Eugene is a firm believer in the Bible. He attended a Bible study just two days before the face-chewing episode, he was called "the preacher" by his friends, and his mother said that he never left home without his Bible. And he had it with him at the time of the attack. It was, in fact, the only thing he had, as he was otherwise completely naked. So it seems reasonable to ask: was there something in the Bible that inspired the attack? Of course it's hard to say, but there is plenty in the Bible that might encourage similar behavior. Take his nakedness, for example. God seems to like his prophets to run around naked. Here are God's instructions to Isaiah. God told Isaiah to walk around naked for three years as a sign and and wonder. Maybe Eugene was just trying to do likewise. The spirit of the Lord came upon Saul and he "lay down naked" all day and night. Maybe the spirit of the Lord came upon Eugene, too. I don't know if Rudy Eugene wailed like a dragon, but I'm pretty sure he had his shame naked. But what about the face-eating behavior? There's nothing in the Good Book that could inspire activity like that, is there? Well, how about these passages? There's plenty there for a naked, face-eating, bible-believing cannibal to choose from. Perhaps Eugene thought that Ronald Poppo was his long-lost father or friend that God wanted him to eat, in accordance with Ezekiel 5:10 or Jeremiah 19:9 . Or maybe that Poppo was just "another" whom God commanded him to eat in Zechariah 11:9. Or that Poppo was one of God's people and, therefore, it was Eugene's job to eat him, as prophesied in Micah 3:2-3. It's hard to know what God had in mind when he inspired these verses. But I suspect that Rudy Eugene might have a good idea. He and God seem to think pretty much alike. Oh, wow, I hadn't heard of this. It's obvious god had a thing for naked dudes. Maybe the Westboro Baptist Church should read their Bible again. I bet these passages are hardly ever mentioned in Sunday-school as it would scare the christian kiddies. Not really Sunday morning sermon-fare, either. It's time believers start reading their Bible, instead of nit-pickingly bashing it. I wonder what a wailing dragon sounds like. To be honest, I think the whole 'taking copious amounts of drugs' thing probably inspired his eating another man's face off, rather than the Bible. His carrying a copy around means he was pretentious, but it's a bit of a stretch to suggest it was integral in inspiring him to take up cannibalism. Yeah, I agree, ORB. It was probably the drugs, not the Bible. I doubt if Eugene even knows these verses are in the Bible; most Bible-believers don't. But an honest believer could chow down on someone's face while quoting verses to justify the act. Is there another book that could be used for such a purpose? I'm sure there's several books out there that someone could quote to justify something. After all, you can quote from any book to justify anything you like; that doesn't make it a credible justification. Just look at Mark David Chapman as an example; dude was using 'The Catcher In The Rye' as his justification for shooting John Lennon. That doesn't make J. D. Salinger partly responsible for Lennon's death; it just means that Chapman was mental (and really bad at coming up with excuses). There's a lot of really horrible stuff in the Bible, don't get me wrong. One of the reasons I like your blog is because it's very good at pointing out this stuff. But on this sort of issue I don't think the book, however unpleasant, is at fault. It's the person. Chapman was crazy, and Eugene should have laid off the drugs. ORB said, I'm sure there's several books out there that someone could quote to justify something. I suppose. But it's hard to find a book where God brags about forcing people to eat their family, friends, and neighbors. Or to lie around naked for 3 years for a sign and a wonder. Stuff like that you can only find in the Bible. I wonder if eating the holy cracker, which is the body of Christ in substance as per the transsubstantiation doctrine, makes catholics face-chewing cannibals as well. Does each of these crackers contains the whole Jesus or just part of him,say part of his right patella for example ? Mr. Wells, I think that you hit the nail right on the temple (I mean spot). The bible, (a book that justifies war crimes that are justified upon earlier war crimes), and social morals do not mix well. 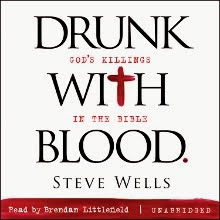 Add to the mix a Bible Thumper who has dulled reason with the use of hallucinogens, (that includes sacramental wine); the obvious results are "Zombie Killers of God". Rudy Eugene was most definitely one of them. Sure take the “bath salts” away and Rudy might have maintained some cloud of reason. But as a Bible Thumper he knew all the crimes and edicts of God and the Prophets. The drugs subdued his reason and all he had left was his ability to listen to the “Word of God” like a “Voice crying in the wilderness” telling him to “eat the flesh of another”…etc. No said, "Does each of these crackers contains the whole Jesus or just part of him,say part of his right patella for example ?" Yes, No, the "sacred host" contains the whole enchilada, the body, blood, soul, and divinity of Jesus. So that would include his face, which means, I guess, since Jesus is both human and divine, that Catholics are face-eating cannibals. I suggest you to add a newslett n your blog, I love it, but I'm not yet using rss feed, as many italians.. and I don't remember to come back to your site weekly if you don't alert me at the new articles..